What if your search for meaning could solve the world's problems? What if everything you are passionate about could save a life or change history? Justin Dillon argues it can, and A Selfish Plan to Change the World shows how. In this paradigm-shifting new book, Dillon--the founder of Slavery Footprint and Made in a Free World--reveals the secret to a life of deep and lasting significance: the discovery that our need for meaning is inextricably linked to the needs of the world. 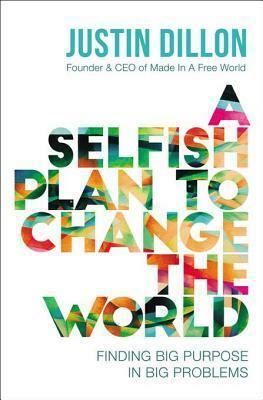 A Selfish Plan to Change the World delivers a revolutionary method for meeting both needs. Drawing upon his own unlikely transformation from touring musician to founder of a global movement and telling the stories of other surprising world-changers, Dillon shows how to create a life of deep purpose by stepping into the problems of the world. Taking readers on a journey from sweatshops in India to punk rock concerts in Ireland, Dillon exposes the limitations of the "giving back" approach involving donations and volunteerism to reveal the unexpected power of "giving in" to pursue self-interest in a way that alters the very dynamics of the world's most challenging problems. A Selfish Plan to Change the World is your "self-help-others" guide to a life that matters, demonstrating how you can repurpose your existing talents, backstory, and networks to improve the lives of others. Changing the world no longer belongs only to martyrs and professional do-gooders. You can live an extraordinary life. You can change the world. All you ever needed was a plan. Cassandra's Review- It is so hard to think about all of the worries and woes that this world has without being overwhelmed with a need to do more to help. What if you are poor or can not get out to find the right ways to do so? What if you are stuck in a situation where you just think you can not help out at all? This book does not direct you, but can open a few more choices that may help you rest your mind and find a way to be more helpful. Obviously we cannot all be like the author or have the advantages to do so, but even the smallest seed can grow strong!